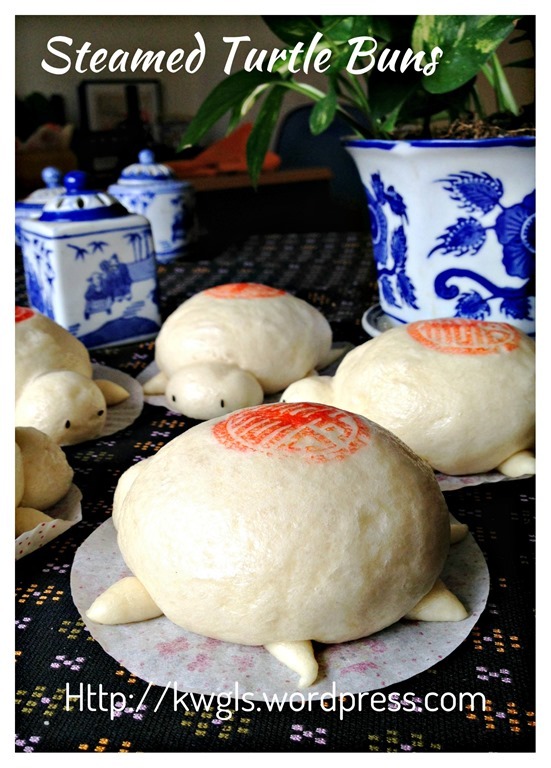 This is a rather niche post, may be only a small percentage of the readers will try out this recipe as these steamed buns are usually prepared for Taoist’s deities birthday celebration. However, it is definitely a nice and healthy bun for breakfast. 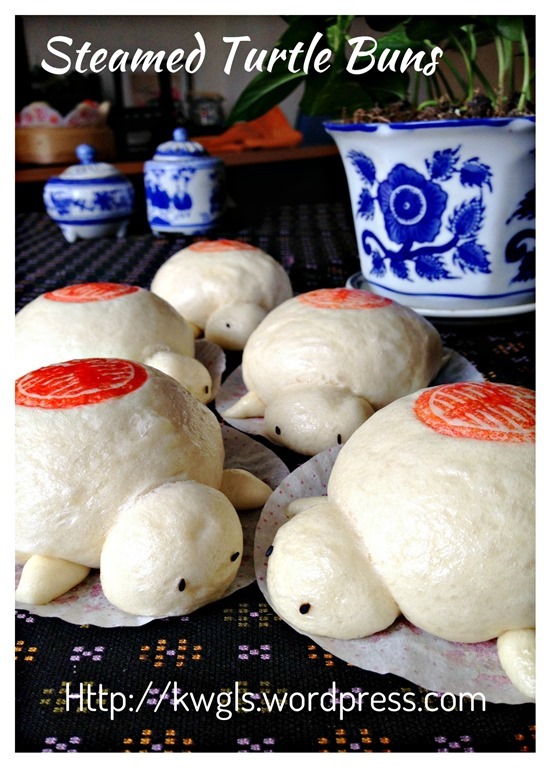 The name of the buns is Miku, literally translated as “rice turtle” or “rice tortoise” . 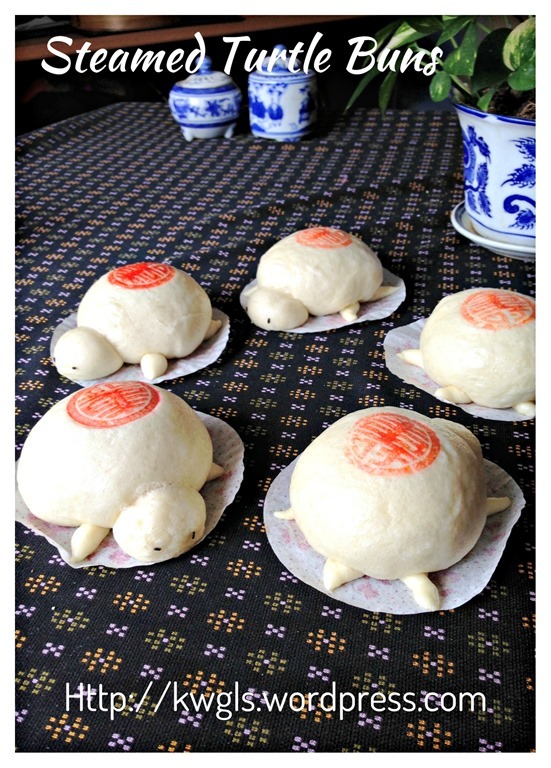 In my hometown, it was white and shaped like a turtle and have a “longevity” chop in its body signifying long life of the deities and followers. 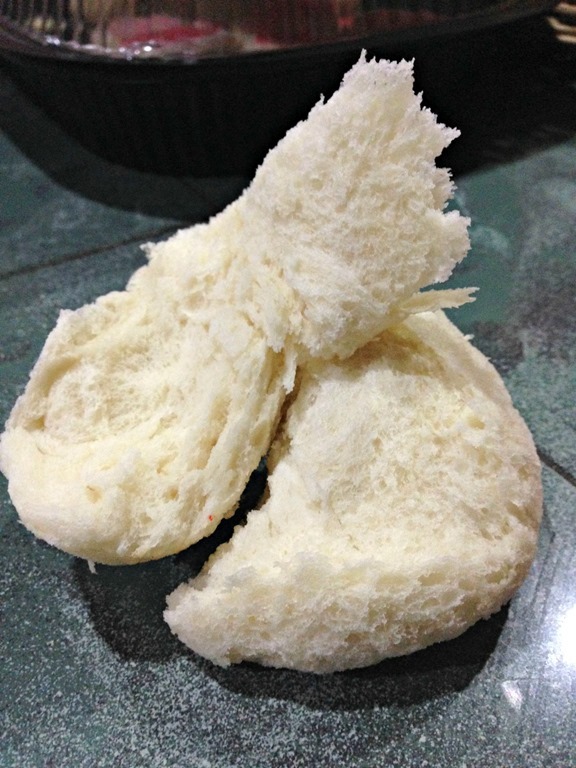 However, in other parts of Malaysia, some like to colour it pinkish red and have various shapes such as the letter “8” shape or just round shape but on the top of the buns, it was purposely cut (like baguette) into flower petals. 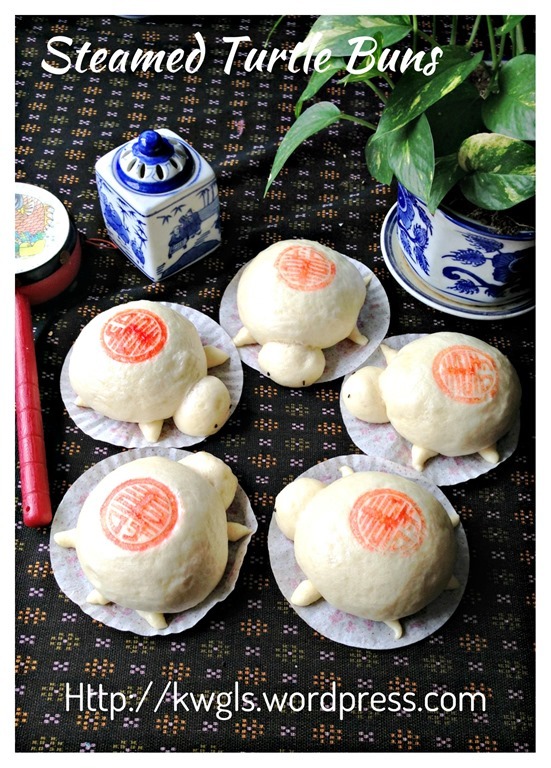 Preparing the buns are not difficult but timing of proofing and steaming have to be given due attention. I have prepared 3 batches, the first 2 batches were over proofed and it was only for the third batch of the buns that I am successful. 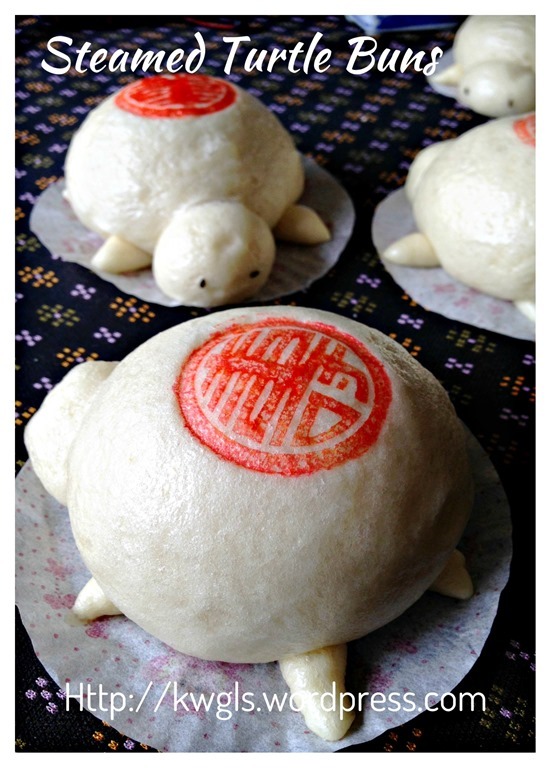 If you have like to colour the bun, you will need to colour it either before or after the steaming. Colour before the steaming do pose some technical difficulties as it may spoilt the dough and possibly lead to over proofing. Get ready a steamer with cold water. 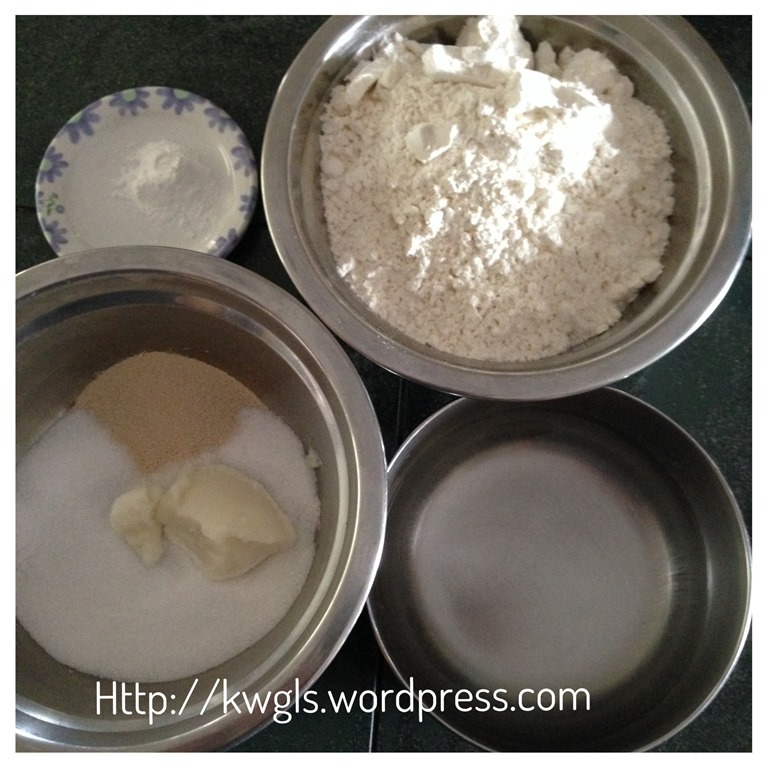 Mix all ingredients and knead in a standing mixer until the dough leaves the sides of the whisking bowl. You can also manual do this until the dough is smooth and not sticky. 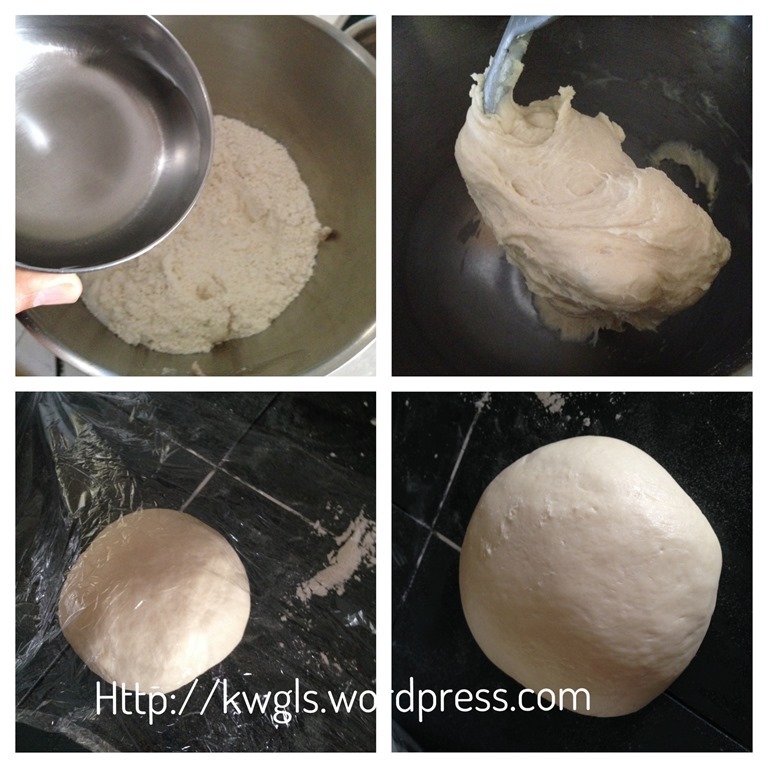 Shape the dough into a ball and let it proof until double in size. Cover with a clingy wrap or wet towel to prevent moisture loss during the process. When the dough is proofed, divide the dough into 5 portions of 80 grams for the body, 5 portions of 8 grams for the head and for the remaining, cut into 25 small portions for the legs and tail. 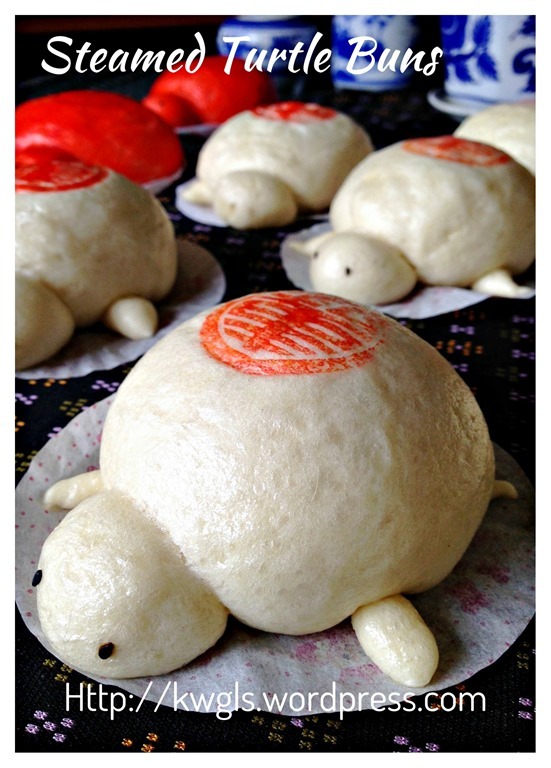 Take a portion of the 80 grams dough, shape round as the body. Do the head, tail and legs. Attach it to the body. 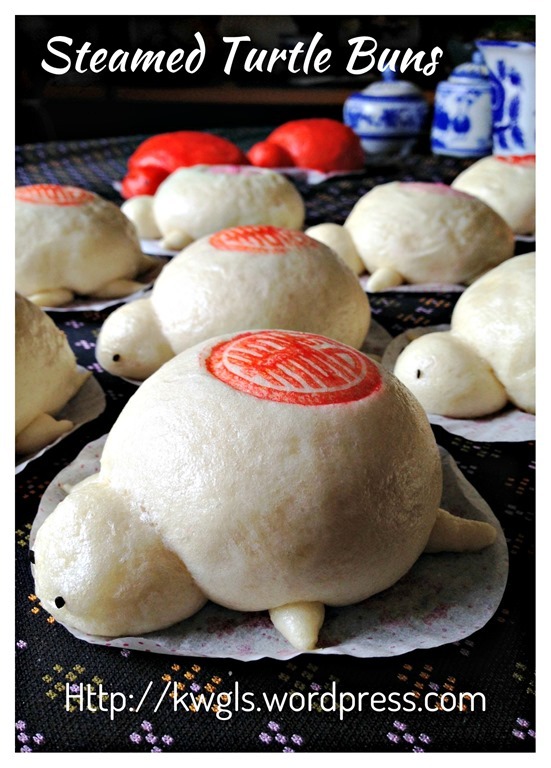 If preferred, put 2 black sesame seeds as eyes. Put in a cupcake cup. 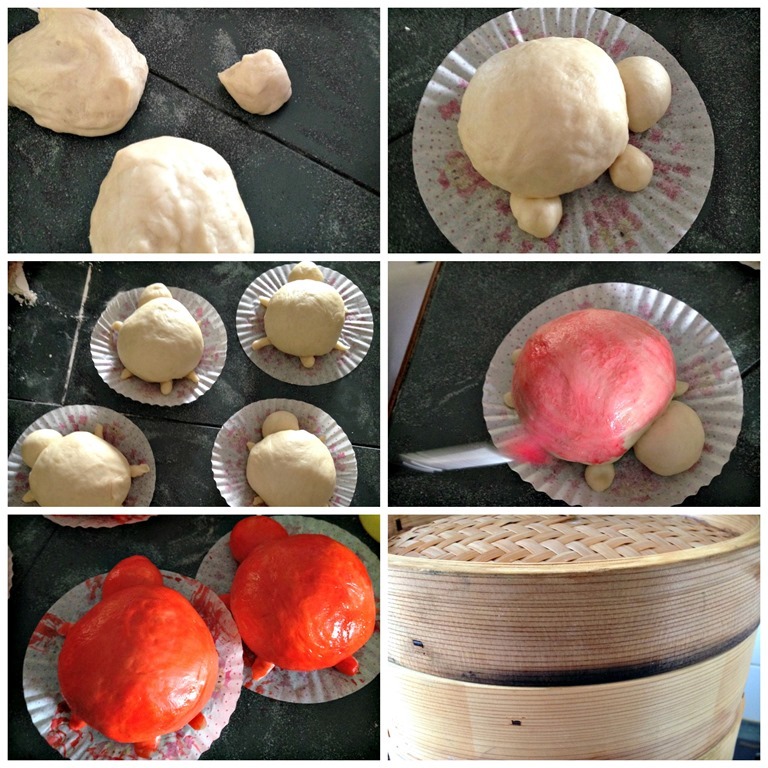 Once the dough reach 1.5 times of the size, transfer the steamer tray to the steamer with COLD WATER. Bring the water boil under high heat and steam for 12-15 minutes （note that the 12-15 minutes starts from cold water until the end of the steaming). 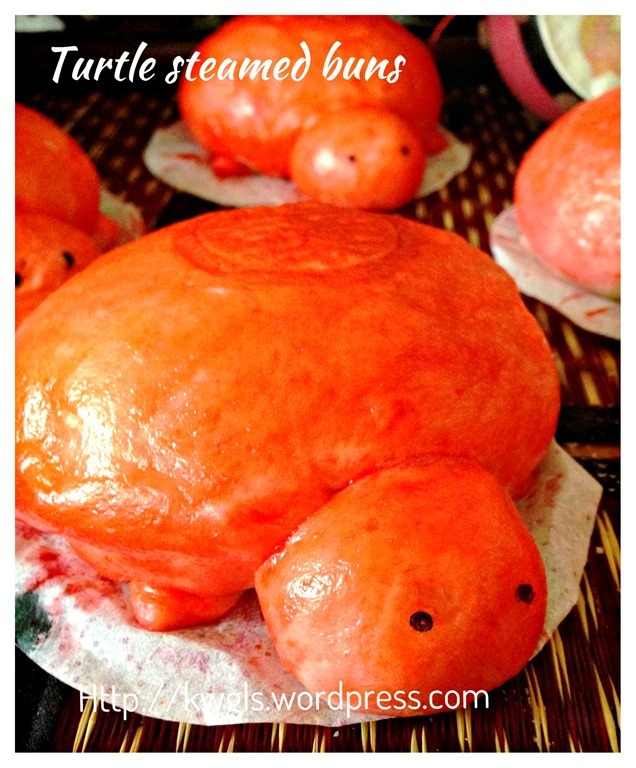 If you would like to colour the turtle, you can colour before steaming or after steaming. 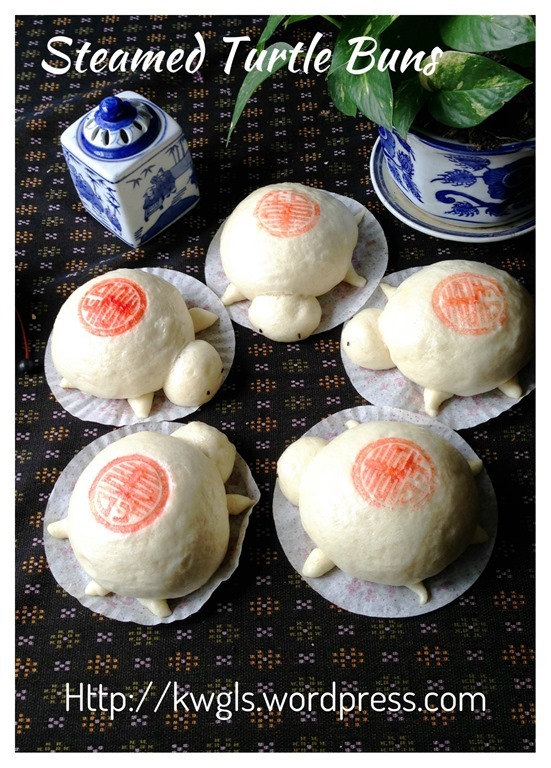 When the buns are steamed, chop the red longevity word on top of the body while it is hot. 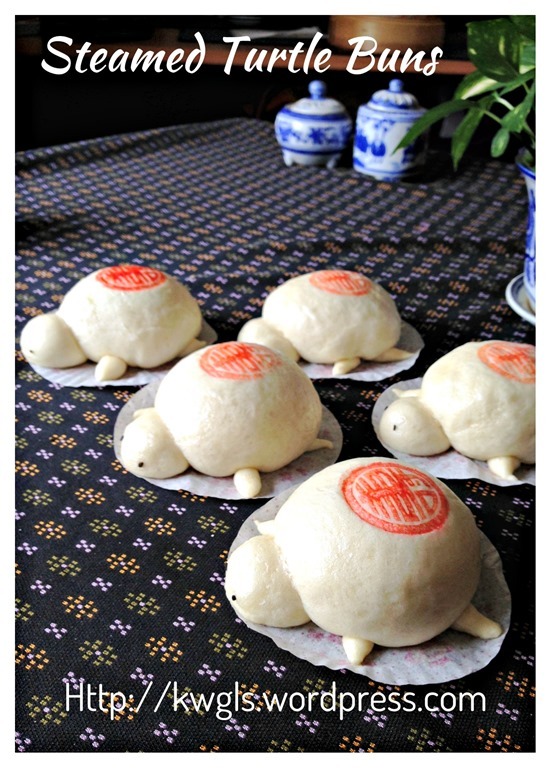 This entry was posted in Chinese and Asian Cakes and Snacks, Food Preparation Series, Vegetarian and tagged 8, 米龟, GUAI SHU SHU, Guaishushu, kenneth goh, Miku, postaday, steamed turtle buns. Bookmark the permalink. Hi Kenneth, it turned out really well. I truly appreciate your tips in not overproofing the dough and covering with cling wrap instead of towel. I used to cover in dry towel and thought that the longer the proofing time is, the better :-). I just baked banana walnut cake with your recipe from facebook. 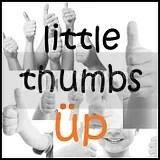 It was fabulous… thanks so much for posting working recipes!! Want to get the shou word stamp, where can I order one do you know? You can try order at the internet. This was given by me from a friend in hong kong.